Former Speaker of the House Newt Gingrich is made a highly disturbing proposal that people who visit sites that are deemed as favoring terrorist groups. As articulated by Gingrich in his Fox News interview, the proposal would eviscerate the first amendment and leave that government in a position to regulate speech and association based on an ill-defined standard. 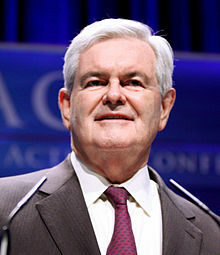 Gingrich also attracted criticism for his proposal to test Muslims to allow for deportation of anyone who “believes in Sharia” — a proposal that would sanction peoplr for their religious and political views. Sharia is incompatible with Western civilization. Modern Muslims who have given up Sharia, glad to have them as citizens. Perfectly happy to have them next door. But we need to be fairly relentless about defining who our enemies are. Anybody who goes on a website favoring ISIS, or Al Qaeda, or other terrorist groups, that should be a felony, and they should go to jail. I have been a long critic of Sharia systems and I share the view that it is incompatible with Western values of due process and free speech. Yet, Gingrich combines his criticism with a proposal that itself would deny the very rights threatened by Sharia systems. People can check out these sites for a variety of reasons. Journalists and columnists routinely visit such sites. So do academics and curious citizens. Moreover, people are allowed to read about and support such causes so long as they do not offer material support to a terrorist organization. If Gingrich were successful, what would stop another Administration from declaring other sites as the basis for arrest like militant pro-life sites or Black Lives Matter sites or militant environmental sites? Once you give the government the power to effectively criminalize ideas or associations, the desire to expand such prohibited zones becomes insatiable as authoritarian figures in China, Iran, and most recently Turkey have shown. Squeeky. A good reporter does research before writing and publishing. The name of the guy in the German song is Horst Wessel. One L.
Furthermore, the clamping down on free speech after WW2 was started by the four occupation forces and was later continued, albeit by less strict laws, by the first Bundestag. In the world of the Director FBI you are an extremely careless reporter.